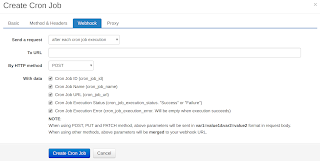 Making a webhook request after cron job execution could be useful for notification or chaining other actions together after a cron job script/program does its work. You could also choose a HTTP method to make the request from GET, POST, HEAD, PUT, PATCH, DELETE, CONNECT, OPTIONS and TRACE. As everybody knows, email and maybe a few other contact methods (SMS, Push message, etc.) are not very dependable ways for notification. 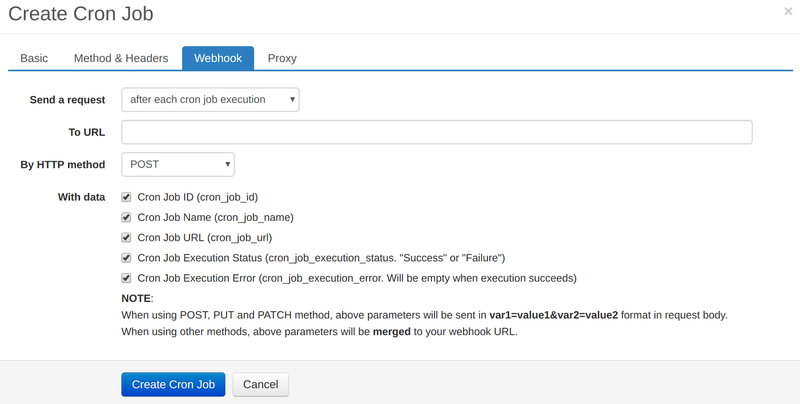 By using the webhook mechanism, users can do a more reliable notification in their webhook target script (Even sending emails to themselves from their own email address has higher arrival rate). And more than this, users can actually do almost anything in the webhook script. This could greatly extend the post-execution functionality of EasyCron. Welcome to share how the webhook feature help you and simplify your work in the comments.